Company continues to support the Denver Human Services project, now in its 8th year of operation. things. That is why every year we work with local organizations such as Denver Human Services (DHS) and the Tennyson Center for Children to give kids a little bit of help, happiness, and their best chance to succeed. Throughout the month of July, the GIVE Center works with community members and donors to provide backpacks filled with school supplies for children who are clients of DHS, including those in foster care, experiencing homelessness, or whose families simply cannot provide their children with needed supplies to stage them for success in school. This year, INODE will be building backpacks full of supplies, snacks, and additional items to put a little swagger in their steps to six young adults between the ages of 13 and 16. Not in the Denver area? No problem. 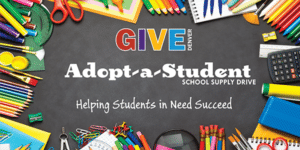 Check out the Child and Family Network Centers in Alexandria, VA (http://cfnc-online.org/school-supply-drive/), the nationwide Kids in Need Foundation (https://www.kinf.org/), or simply Google “School Supply Donations Near Me” to find a local option to support. Your time and care can make a difference.